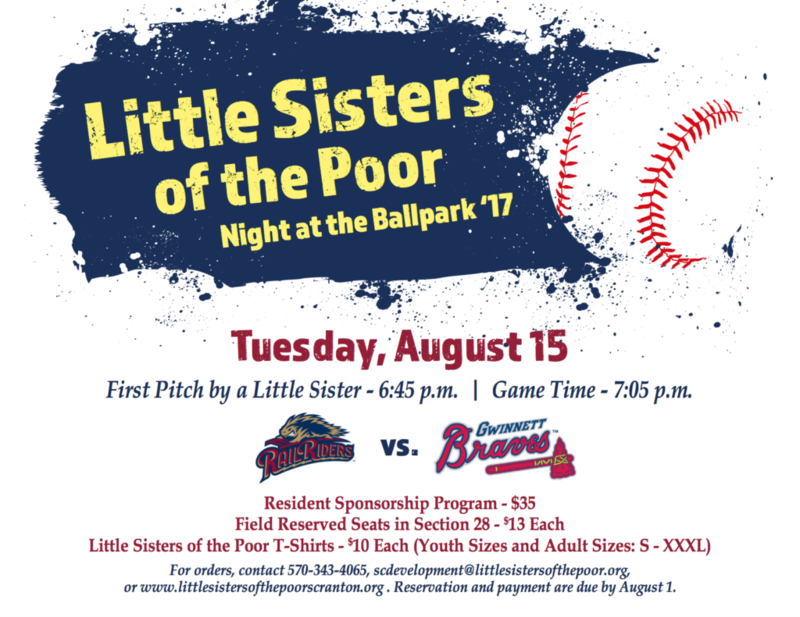 The Little Sisters of the Poor at Holy Family Residence, Scranton, invite the community to join them for a fun-filled, family-friendly evening as they celebrate their fifth annual “Little Sisters of the Poor Night” on Tuesday, Aug. 15, at PNC Field, 235 Montage Mountain Rd., Moosic. Prior to the 7:05 p.m. game where the Scranton/Wilkes-Barre RailRiders will take on the Gwinnett Braves, the Little Sisters will be available at the plaza entrance of the stadium to talk with visitors and also provide a pre-game, on-field interview about Holy Family Residence and their mission of serving the elderly poor throughout the world. At 6:45 p.m., one of the Little Sisters will throw out the ceremonial first pitch of the game. Tickets are $13 each for seats in the stadium’s field reserved section 28. Little Sisters of the Poor baseball t-shirts are $10 each and available in youth sizes as well as adult sizes small through 3XL. If you cannot join in the fun, but you would like to send a Resident in your place, please be sure to support our Sponsor a Resident program which is $35. For more information, please call (570) 343-4065 or email scdevelopment@littlesistersofthepoor.org by August 1. Orders can also be placed online here >>.